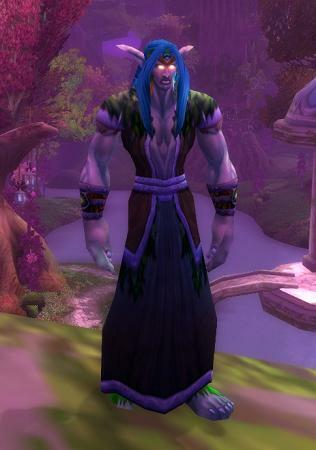 I devote this part of my web to "Livius", my character on the World of Warcraft server "Darkmoon Faire (EU)". I started playing WoW in SEP 2006 and departed in JAN 2012 because, to reduce a complex topic to just one sentence: I became disillusioned and frustrated by how Blizzard progressively dumbed the game down to cater to the Instant Gratifcation Gamer. I rejoined WoW after a 19-month absence for MoP. I noticed that the problems that compelled me to depart were still there, but I reminded myself that no game is perfect. I admit the strong pull of nostalgia. I wished see old friends. And the Panda lore wasn't as bad as I feared. Still, after three months, not even nostalgia and friends could hold me. After another break, I returned to play WoD, but again left after three months. I hear good things about "Legion" and I'll probably come back at some point to check it out ... and then leave again. Perhaps one day, Blizzard will realize what an injustice they've done to what used to be a grand game and find the moral courage to roll some of it back. Perhaps one day they'll even bring their graphics engine into the 21st century. A Legacy Server wouldn't hurt either. Not likely, I know. But I'm an optimist and hope springs eternal.